Today in 2004, Mean Girls was released in theaters—and pop culture has never been the same since. Aside from gifting us the likes of Amanda Seyfried and Rachel McAdams, as well as cementing the careers of Lindsay Lohan (for better or worse), Tina Fey and Amy Poehler, the movie moved high school comedy into high art. "Fetch" never happened, but Mean Girls spews a landmine of quotable quotes, the volume of which can't be said the same for many movies of the Naughties. Everybody from Jennifer Lawrence to Mariah Carey can still recite the cutting, laser-sharp lines as if Motorola Razrs came out yesterday. We have long survived our first three-way calling attacks, but we can never outgrow Mean Girls. If anything, we have no doubt Mean Girls would fit right in 2014 as well as in 2004. 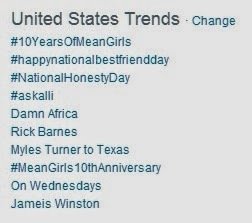 #10YearsofMeanGirls, among other Mean-related topics, is currently topping the trends in that market index of the zeitgeist, Twitter. Media outlets from The New York Times to CNN are paying their tributes right now. Yes, there's no drama as evergreen as girl-on-girl drama. It's, like, against the rules of feminism!